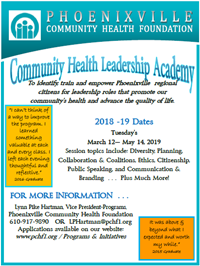 The Ride for Health Initiative is a program of the Phoenixville Community Health Foundation. Since September 2006 the program has addressed the needs of persons with transportation barriers to medical and social service appointments. In 2011 the program was evaluated by Villanova University’s Dr. John M. Kelly. We invite you to read his Executive Summary.